Local sailors know Setauket Harbor as a small, protected harbor on the western shore of Port Jefferson Harbor, situated roughly at the midpoint of the northern coast of Long Island. Legend has it that during the Revolutionary War, Setauket Harbor was Caleb Brewster’s favorite hiding spot to evade British soldiers when rendezvousing with other members of the Culper Spy Ring who had gleaned important information about enemy troop movements that needed to get to General Washington in West Point, New York via Connecticut. The Riverhead Aquarium’s Touch Tank exhibit fascinated both kids and adults alike. In later years, Setauket Harbor was home to ship captains and boat builders who made their living from the sea. Many were in the whaling trade, and you can find evidence of their involvement in the legend “Made in Setauket” stamped on one of the last remaining whaleboats on display at the Cold Spring Harbor Whaling Museum. Today, the harbor is home to about hundred recreational boaters and sailors who moor their small boats along its inner channel, knowing well that the harbor’s geography will protect them from late season storms. Over the years, however, as more and more homes were built along its shores, the harbor’s sandy bottom filled with mud and muck from erosion and its natural treed shoreline was cut back to provide views and lawns for new residents. With the new residents came septic issues, which led to nitrogen seeping into the harbor waters and causing algae blooms and seaweed growth. Furthermore, runoff from roads and properties, much going directly into the harbor, caused shellfishing to be restricted by New York State. Fast forward to 2014, when a group of Setauket residents, some of whom lived on its shore and others who just loved the specialness of the harbor, got together to see what they could do to reverse the plight of the harbor and its waters and bring it back to health. In the two and a half years of the Task Force’s existence, the group has become a clearinghouse for information about the harbor and was named “Men and Woman of the Year” by the local community newspaper for its activism and success in getting people together to begin to save the harbor. Free boat tours of the harbor were a big hit at Setauket Harbor Day. 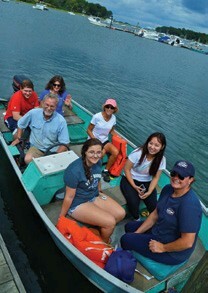 Last year, the Supervisor of Brookhaven, Edward Romaine, in partnership with the Task Force, hired Cornell Cooperative Extension to undertake a comprehensive water quality analysis of the pathogens in the harbor, the findings of which will be the basis for a harbor water improvement plan that will assure cleaner waters in the near future. 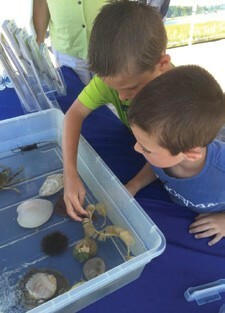 Last month, the Task Force hosted its second annual “Setauket Harbor Day,” a free all-day family event with marine-themed exhibitions, music and food that was enjoyed by scores of harbor lovers. The biggest attractions of the day were the free boat rides, kayak, paddleboard and sailing lessons offered by local Setauket businesses which got a lot of people off the land into the harbor waters. The entrance to Setauket Harbor is through a marked channel just north of the power plant. There are no transient moorings available, but there are plenty of transient moorings in Port Jefferson Harbor (VHF channel 68 or 631 796-4462) and visiting boaters can tie up dinghies at the Setauket Harbor town dock on the southwestern shore and walk to several restaurant and stores. To learn more about the Setauket Harbor Task Force and join our efforts to protect this lovely body of water for future generations, please visit us on Facebook at facebook.com/SetauketHarbor. In addition to being a founder of the Setauket Harbor Task Force, George Hoffman is an avid sailor. He is busy sailing and restoring a 1983 Cape Dory 28 which he keeps in Setauket Harbor.